Let’s look at some of the popular CMS platforms that some of our office space tenants at our business centre, as well as some of our virtual office clients, use as their CMS website platform. WordPress is currently one of the most popular CMS platforms and it was originally developed as a tool for blogging. While its main function was to provide an easy and fast way for users to write and publish new blog content, the functionality of WordPress has grown so significantly that it is now used to power millions of very different personal and small business websites. 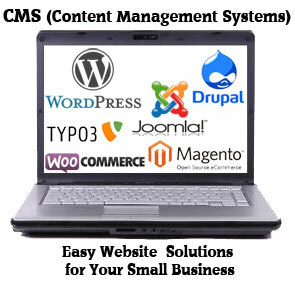 WordPress now offers the main function of a CMS with complete control over creating, modifying and publishing content. Having the ability to create static pages and e-commerce on the same platform as a small business blog, gives businesses a single place manage their web presence. Another popular CMS is Drupal. Drupal is also a free, open-source CMS that allows practically any type of user (whether it be a single small business owner or a staff of users) to easily publish, manage and organize a wide variety of content on a website. Thousands of people, companies and organizations are using Drupal to power many of different websites. ExpressionEngine (EE) is a flexible, feature-rich content management system that allows thousands of individuals, organizations and companies around the world to easily manage and maintain their websites. The learning curve for EE may be a great deal easier to comprehend than Drupal. it is not, however, a free open source CMS platform. For those who believe that Drupal has a high learning curve, ExpressionEngine might be for you. ExpressionEngine is fairly easy to learn and even easier to use. ExpressionEngine has some of the most amazing support – a huge knowledge base, extensive documentation and a staff and user-monitored support forum. Many web developers will say that ExpressionEngine is hands down one of the best CMSs available today, but is it the best for a small business looking to create their first website? We would be remiss if we did not mention Joomla. Joomla was one of the most popular content management system software applications out there, but has been seen to been overshadowed by newer CMS platforms. This application has proven itself incredibly flexible in terms of configuration and customization, and it offers an unparalleled level of user management and should not be overlooked as a good CMS solution. While there are less people programming new plugins for WordPress and Drupal, many will say that Joomla is still the best open-source CMS available. Currently, Telsec uses WordPress as our blog platform and is very happy with how it works and the usability of it. We are currently re-developing our site using a custom CMS, but that is because we want more control over the design and functionality – that an out-of-the-box CMS platform cannot provide. Once you get your website into a database format, it is not that hard to convert from one of the popular CMS’s to a custom platform. Even with a custom CMS for our static pages, our blog will still remain on WordPress. Are you more sick of hearing about the Tiger Woods affair or hearing Christmas music on the office radio.